I build a wide Variety of fun hand-made instruments from Cigar Box Guitars & Ukuleles to 1850's style Banjos, Cigar Box Amplifiers, & Lap Steel Guitars. I put the head on the back of this Ukulele. 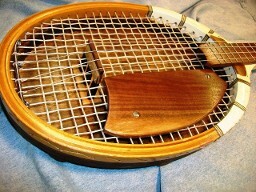 The bridge goes through the racket strings to the back which acts as the resonating head. Two pieces of red oak keep the back off your body so is will sound out loud and clear. 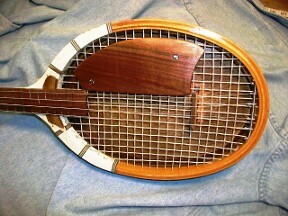 I put a 1/4" thick fret board over the neck of the racket with 18 frets installed on the 18" scale neck. I laminated 4 pieces of black walnut on for a nice looking tuner head with 4 inclosed geared tuners which work smoothly with the Nylgut strings that give this Uke a wonderful traditional sound. I also installed a black walnut "Pick Guard" to elevate your hand for a comfortable playing height above the strings. The action is low and easy to play. This littleTenor Ukulele really sounds great and is just a great conversation piece. Below is a wonderful little instrument. It is a Concert size Ukulele with a 16" scale and 16 frets. It has great sounding Nylgut strings for that true Ukulele tone. It is fretted with medium nickel frets and a good low action for ease of play. It is made with a beautiful yellow, red, blue, & gold Partagas Cigar Box. The box measures 7 1/4" wide 1 1/2" thick, & 8 3/4" long. The Sound Hole is 2" in diameter. The instrument is 23" long. It is framed inside for support and the box is totally hollow for better sound. The neck is solid Red Oak and fully rounded and shaped for maximum playing comfort. The bridge is Black Walnut and the Nut is made of hard Corian that does a great job. This is my first Ukulele after about 50 cigar box guitars and 12 Banjos. I think it is my favorite of all the instruments I've made yet. I just love it! It sounds Great too! My 1850's style Banjos are made of beautiful Black Walnut giving them an old-time look and a great Tone for playing. There are over 70 pieces of wood in each Banjo. The pot is covered with Goat skin and has a unique internal tensioning system to adjust the head (pictured below). The old time tuning pegs are made of hard Maple and tapered perfectly for ease of operation. With the Nylgut Strings and a natural head these Banjos deliver a beautiful authentic sound for the Claw Hammer player. David Holt, 4 time Grammy award winning singer, song writer, story teller, and all around great guy, graciously took his time to help me with my design until finally he commented that "Now you've got a real Instrument". My basic Cigar Box Guitars have the traditional 3 strings and are designed for slide playing to deliver the old Mississippi Blues riffs. 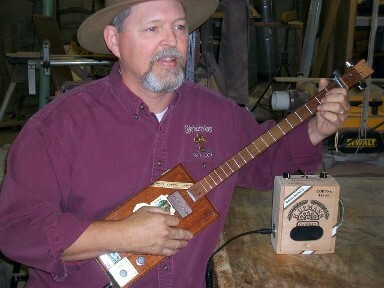 These old style cigar box guitars are what artists like B.B.King and Carl Perkins cut their teeth on to become legends. All my guitars have at least 1 acoustic pick-up just under the brass rod bridge delivering loads of crisp sound to your amp. The necks are all 3 pieces laminated to help eliminate any warping. The next step up is to one of my Resonator Guitars. Each one has 2 acoustic pick-ups and some unique style of resonator. One has a Tuna can with a walnut "X" bridge transferring the vibrations to the bottom of the tuna can resonator which is raised off of the back of the box. Others have small pet water dishes supported by the box top allowing the bottom to be free to sound out. Each has a volume control and some also have tone controls. The necks are built around the resonator inside the box but come back together at the end to capture the string tension. These necks are also at least 3 pieces laminated to avoid warping. All my boxes are made to be opened in case there is ever a problem with the electronics. Some of you might want a little more out of your CBG's and for you I have some true electric guitars. I have built several of these with single coil Pick Ups and volume controls. Some may have tone controls also. These guys deliver enough power to the amp to rock the house. Here's a closer picture of an electric 3 string slide guitar. These pick ups are also hand made with about 6000 wraps of 44 AWG copper, potted in bees wax/ paraffin wax mixture to help eliminate RF problems on stage around other equipment. These guitars can also be opened to access all the electronics in case of any failures. This is totally unique 6 string Lap Steel guitar. It is completely my own design and everything is hand made except the tuners & controls. I even made the knobs for the controls out of Walnut. This Pick Up is really hot with over 10,000 wraps of 44 AWG copper and potted. It sounds great connected to a good amp. Here are some of my Cigar Box Amps. These little things are my best sellers because you don't have to play to enjoy the quirky little things. You can play your MP3 players, music on your phone, or anything that puts out sound through them. I make some with Radio Shack parts but lately I shop at Good Will for discarded Boom Boxes and use the parts out of them. This way I can get volume, tone, balance, headset jacks, and sometimes an echo control. They are great little amps. Hey Guys, if there is something you want that I don't show here just let me know and I can probably build it for you. If you have some special box or tin or just about anything that you want a guitar made out of contact me and lets get that done for you. Here I am acting like I'm playing one of my guitars. I can play about 10 seconds of what sounds like music but I can make enough noise to attract attention at a festival. I really enjoy making these instruments and I pour myself into them. I am very particular about how everything comes together because I want to put smiles on people's faces with what I produce in my work shop.